In this review of the Tribord mask, I point out the pros and cons of this particular mask. Regardless of which full face mask you pick, you'll see why picking a good quality one is important. I bought 2 different sized Tribord full face masks for my boys for Christmas 2 years ago. Keep scrolling to find out more about these innovations, our experiences with them, and why I now believe the hype of 'once you try a full face snorkel mask' you'll never go back to a traditional style snorkel and mask again! 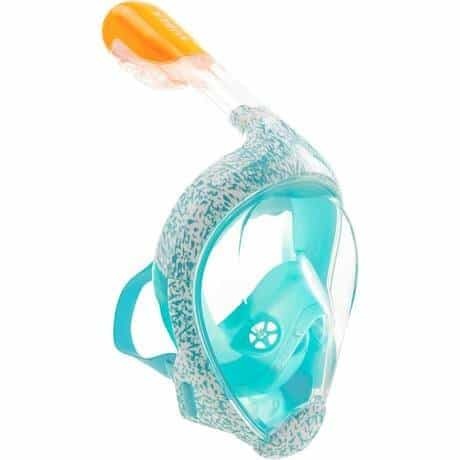 If you already know the Tribord Easybreath Full Face Snorkel Mask is for you, click on the button below to see the current price and any discounts that may apply. Click on the line on the table below to go to the answers of your most pressing question, or continue to scroll for the entire review. Do you know all the good things about full face snorkel masks? How does a full face mask and dry top snorkel work? 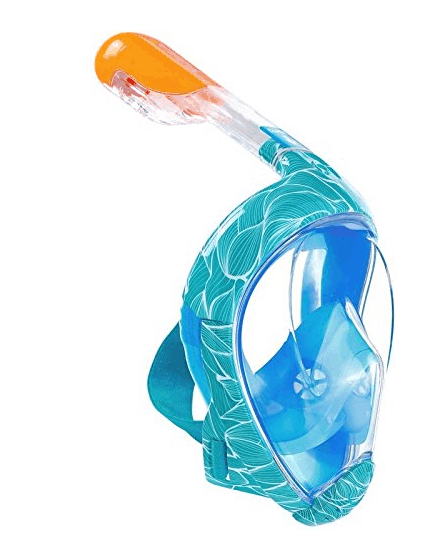 What colors are Tribord EasyBreath Full Face Snorkel Masks available in? 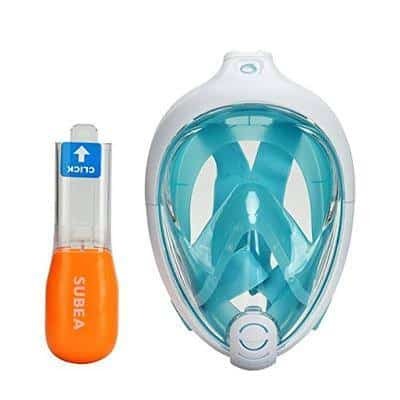 Tribord Versus Subea Snorkeling Masks - What's the difference? 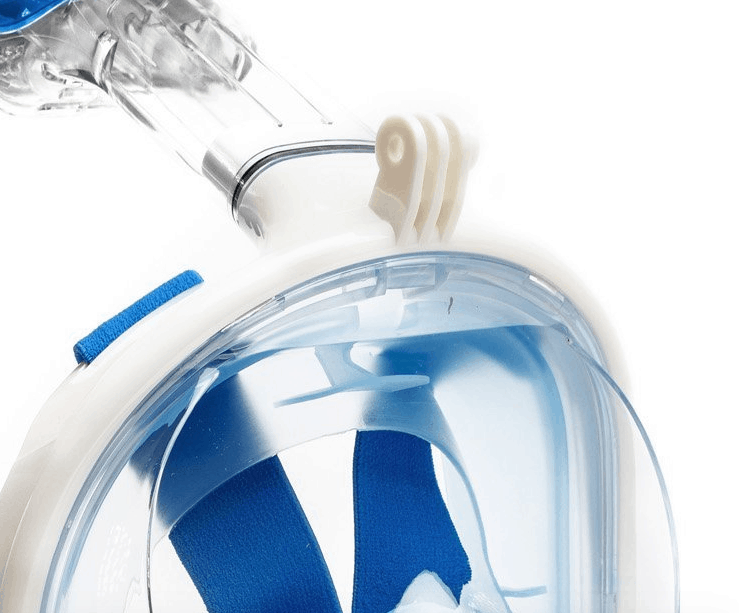 The Verdict – How does the Tribord EasyBreath mask compare? I absolutely love the concept of the full face snorkel mask. There are so many things to enjoy. Breathing is easy, as there’s no snorkel piece in your mouth. 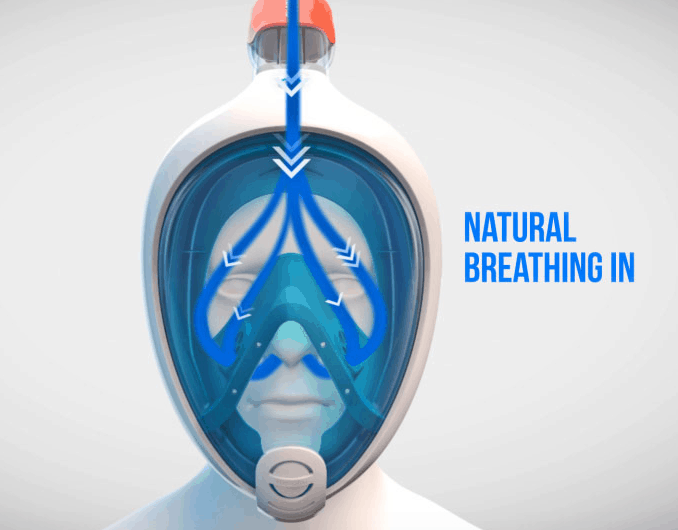 The way the masks are designed makes it easy and natural to breathe through your nose and mouth. There’s a simple but clever float system to stop water from entering the snorkel. The float ball rises and stops water from entering when you submerge. The float also stops water entering the snorkel in choppy water. 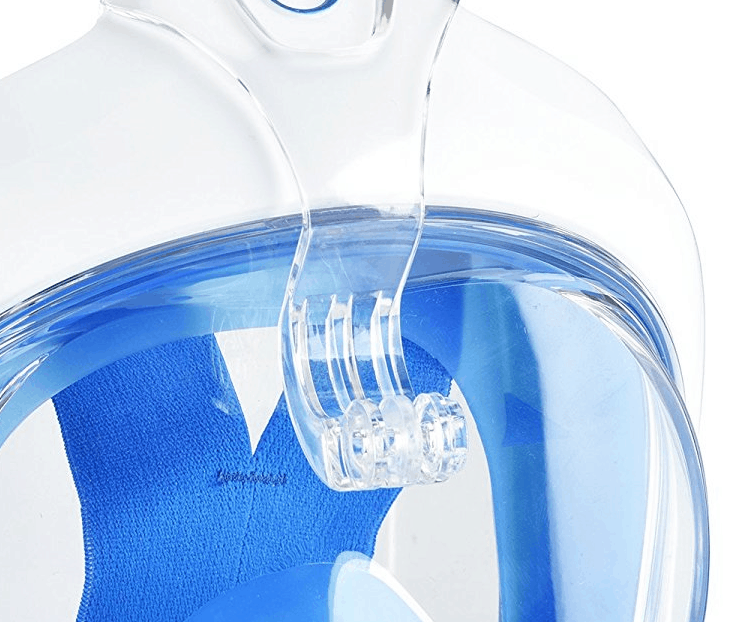 If any water does enter the mask, this drains out through a valve located at the chin area, as soon as you lift it above water level. There’s NO FOGGING at all. One of my kids would get frustrated having to constantly clear his regular mask of fog. This just doesn’t happen with the Tribord Easybreath full face mask. 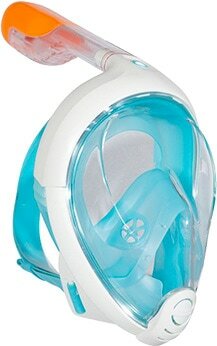 These have been designed with a double chamber airflow system so all fogging takes place in the lower part of the mask. This area is separate from the viewing area. No jaw fatigue – Anyone who suffers from jaw fatigue (like me) will know the feeling after clamping down on a mouthpiece for an hour or so. With the full-face snorkel mask, there’s no jaw fatigue even after hours of snorkeling. The field of vision is unequaled. These masks have an 180° field of vision and the lens is made of a shatterproof poly carbonate. 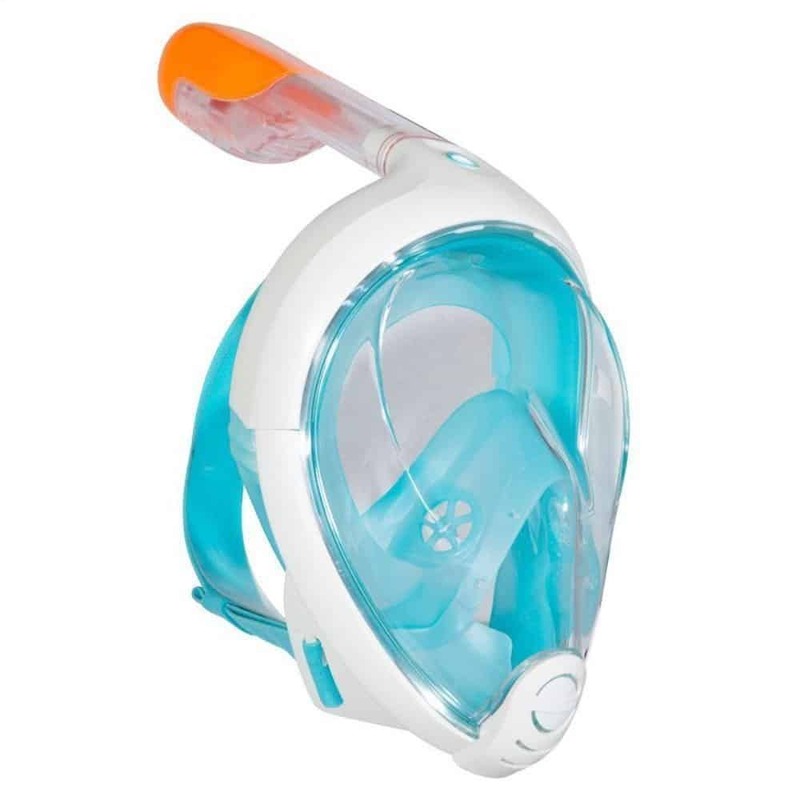 The snorkel piece detaches from the mask so it and the snorkel mask can be stored or transported in the mesh bag that it comes in. Full face snorkel masks use a Dry Top Snorkel system, so they have a ball (or float) inside the tube that rises and closes off the tube as you go under water. This effectively stops water from entering the snorkel tube when you go underwater. As you're submerging, you take a breath and hold it. When you come back up, there's no need to blow water out of the snorkel. You simply start breathing normally again once back up on the surface. If any water does get in, it is drained from the valve in the chin area. The video below shows how the Tribord Easybreath Full Face Mask and Dry Top value works. 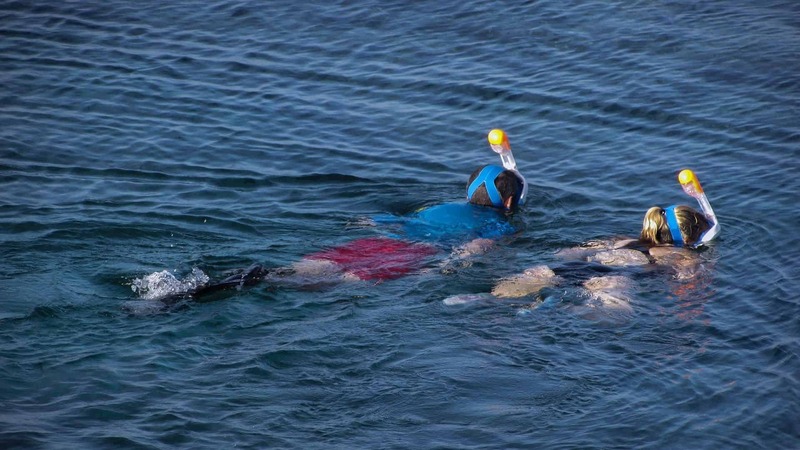 It is being trialed by people who aren’t regular snorkelers. Each year as new design improvements are made, these full face snorkel masks just keep getting better. What’s the difference between the old Tribord Easybreath masks and the new version? The new version masks come with a hypoallergenic silicone face skirt. The air valves have also been improved and the air flow is improved, circulating more fresh air. The new model also has an better Secure Lock Snorkel with the Dry Freak O-ring. The snorkel piece will never accidentally release, and the O-ring has a 6 year life cycle. The spare ring is included in case the original ring gets damaged or lost. An advantage Tribord has over most of it's competitors is an orange fluorescent tip on the end of the snorkel. This is to help other water users see snorkelers in the water easier. Tribord Easybreath snorkel masks have one big advantage over most other full face masks. These come in 4 sizes making it very easy to order and be confident you’re going to get a good fit. I ordered mine over the internet so went by the standard size guide below. It made choosing the correct sizes very easy. Also knowing that if I got it wrong, these could be easily exchanged, gave me that extra peace of mind. I didn’t need to worry about exchanging. Select Size X/S – If it measures less than 3.9″ (10 cm) – This is a Junior size for children up to the age of 10 or 11. Select Size S/M – If it measures between 3.9″ – 4¾” (10 cm – 12 cm) – this is a small adult mask and covers most women, children 11+ and teenagers. It fits slim faces. 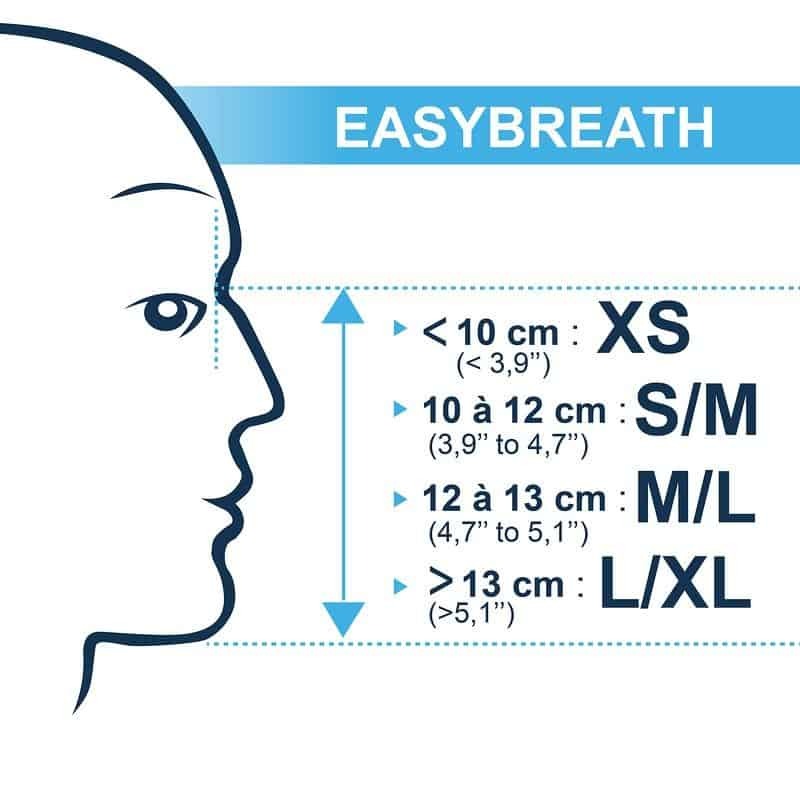 Select Size M/L – If it measures between 4¾” – 5.1″ (12 cm – 13 cm) – this is a wider face, fitting mask. This size will fit older Teen boys, and average size men and some women. 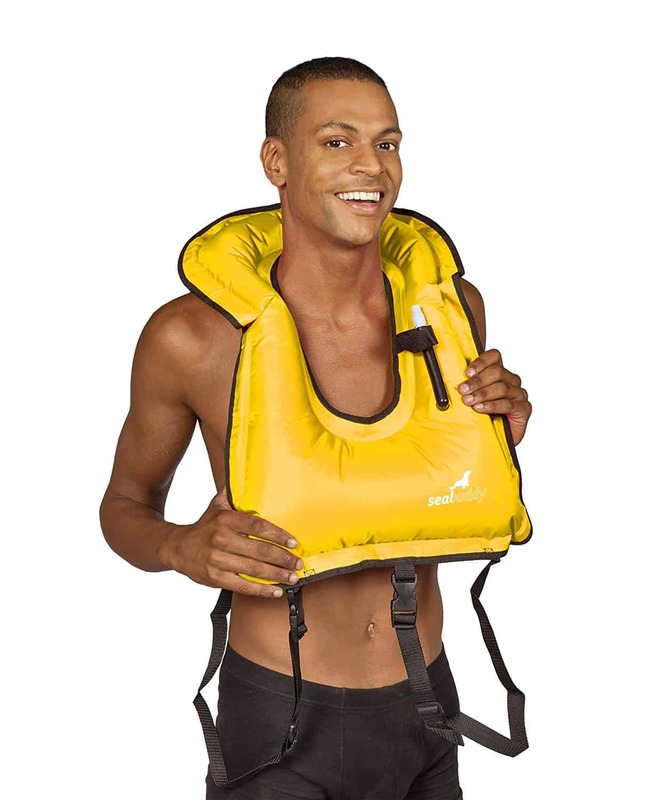 Select Size L/XL – If it measures more than 5.1″ (13 cm and above) – generally for larger men. If you’re unsure, it’s always best to go DOWN a size. The 4 sizes cover around 90% of people. When you receive your mask, put it on to check that there’s no gap between the bottom of the mask and your chin. This is the most common reason for the mask letting in water. The masks come in 4 base colors, Orange, Blue, Pink, and Turquoise (Turquoise is listed on some online stores as Atoll or Lagoon). When ordering, make sure you pick the correct size in the color you want. I know this sounds basic, but sometimes you can be so focused on getting the size right, you may not notice which color you’re ordering it in. Tribord Subea has released a Limited Edition range of full face snorkel masks. The Limited Series all-over design patterns are inspired by the way light plays on seabeds, the movement of light underwater, shoals of fish, and a coral palette. Being Limited Edition means they do cost a little more, but these really stand out and look amazing. There are 5 new designs. These are available in sizes S/M and M-L. They are not currently available in XS kids sizes or Extra Large sizes. Click on the image to see the Limited Edition Tribord Easybreath Full Face Snorkel Mask in more detail. Tribord are slowly changing their brand name to Subea. They started releasing full face snorkel masks with Subea stamped on the snorkel section in 2017. As part of this brand shift, Tribord Subea are no longer releasing the XS mask size for children. They claim the reason for this is to cut down on their manufacturing costs. There are still some suppliers who have the XS size mask available but these will become more difficult to find. 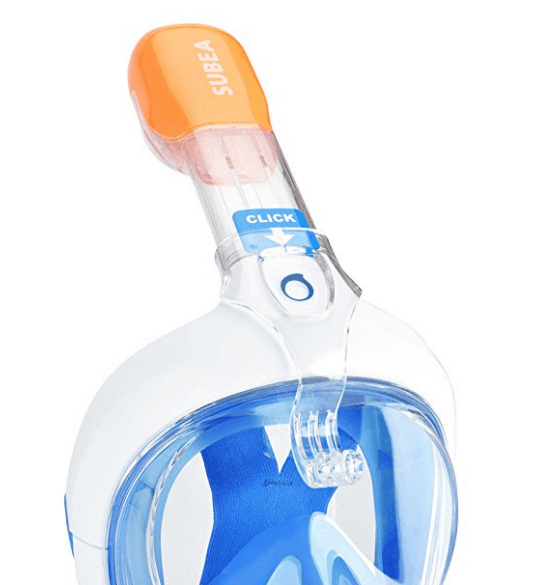 There are Subea snorkel masks available online that don't carry the full range of sizes available in comparison to the Tribord masks. Subea says that this cuts down on manufacturing costs, and this is the reason they're able to sell these masks for less than those labeled Tribord. 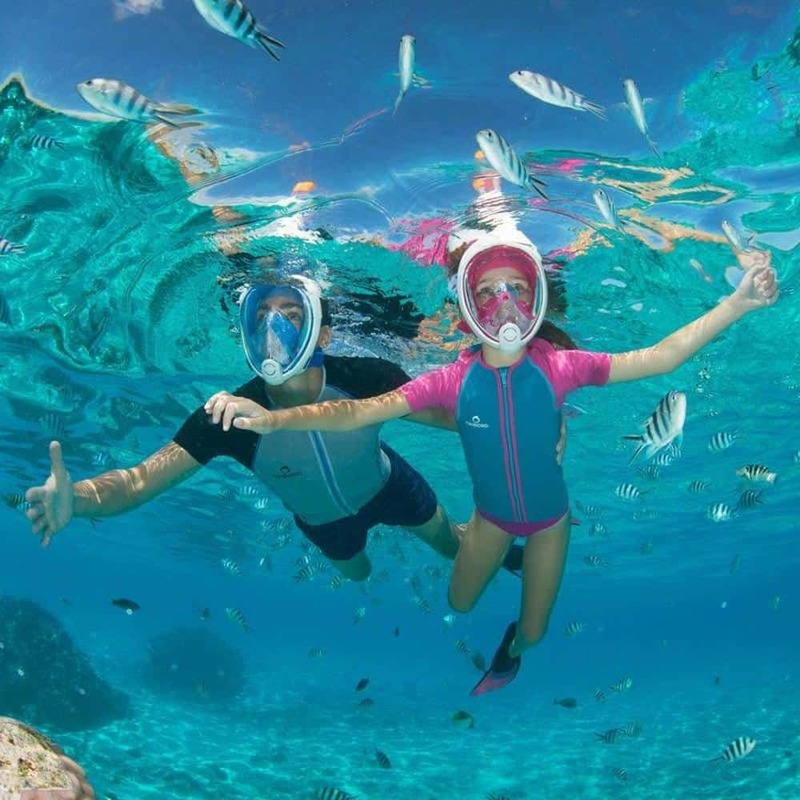 If you're having trouble finding a quality full face mask for a child under 11, then Ocean Reef Aria, Wildhorn Outfitters SeaView and Usnork Anti Fog full face snorkel masks all have an XS children's size. There’s just no getting around this one…. beards and hair will cause water to enter the mask. Whether it’s a traditional mask or any full face snorkel mask, water will get in if there’s hair between the silicone skirt of the mask and your skin. Beards create tiny spaces that will allow water to get through. Water will also leak in if you don’t clear long hair out of the way when you’re putting the mask on. It may feel like a tight seal, but a fringe or long hair trapped between the silicone of the mask and your skin will allow water to seep into the mask. 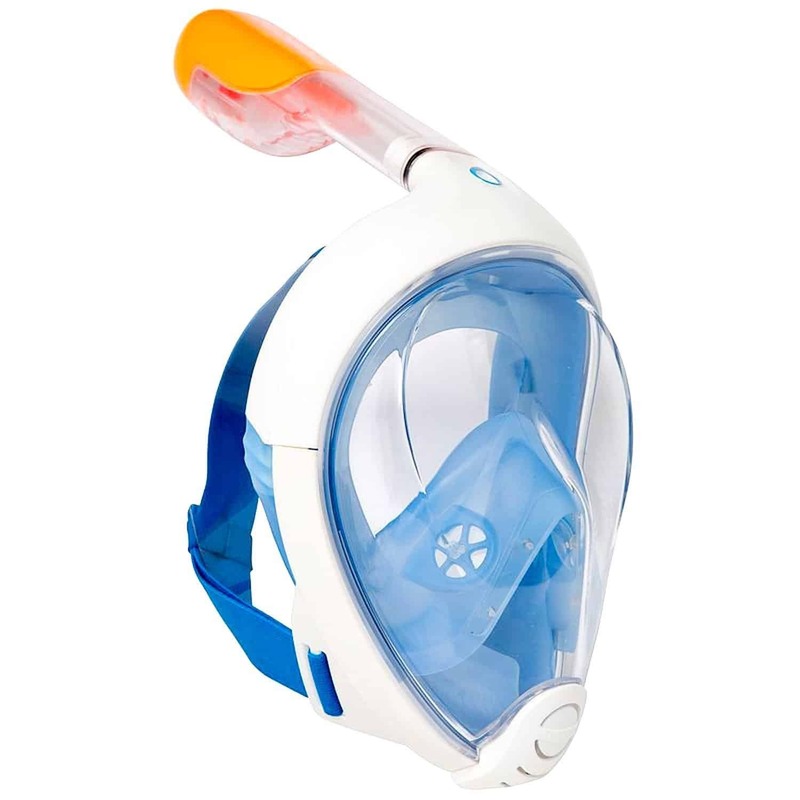 Snorkel masks are designed for leisurely surface snorkeling in relatively calm water. The float valve system only works when the snorkel is in a vertical position. Just like a traditional snorkel and mask, if you lean your head too far forward some water will enter the snorkel. This also applies if you're standing in water and look up at the sky - putting your head back in this position will force the float to cut off the supply of air. It's just one of those things to be aware of. 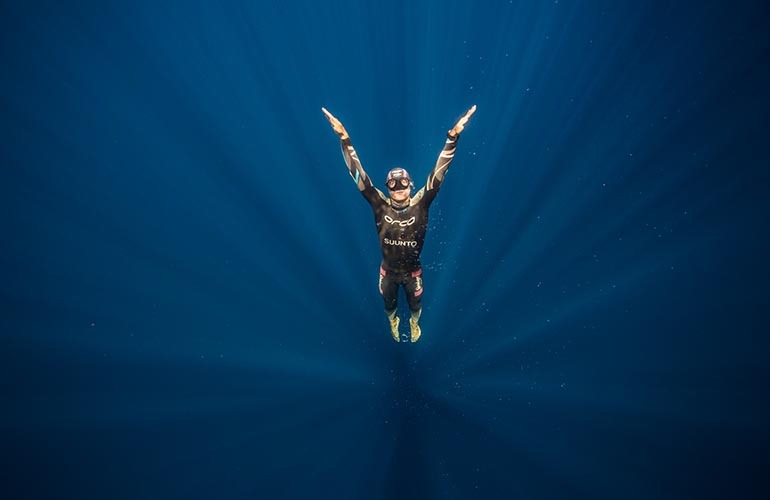 Water can get into the snorkel when free diving, or duck diving. These are also not designed for Free Diving. There’s too great a volume of air inside the face cavity of the mask, and it will quickly become uncomfortable under the pressure. The mask can start to become uncomfortable below depths of 10 feet. Do not buy one of these if you want to use a snorkel while swimming laps. You’ll be disappointed with the performance, as full face snorkel masks are simply not designed for this. If you want to swim laps, or love deep duck diving while snorkeling, then have a look at the PowerBreather Snorkel. 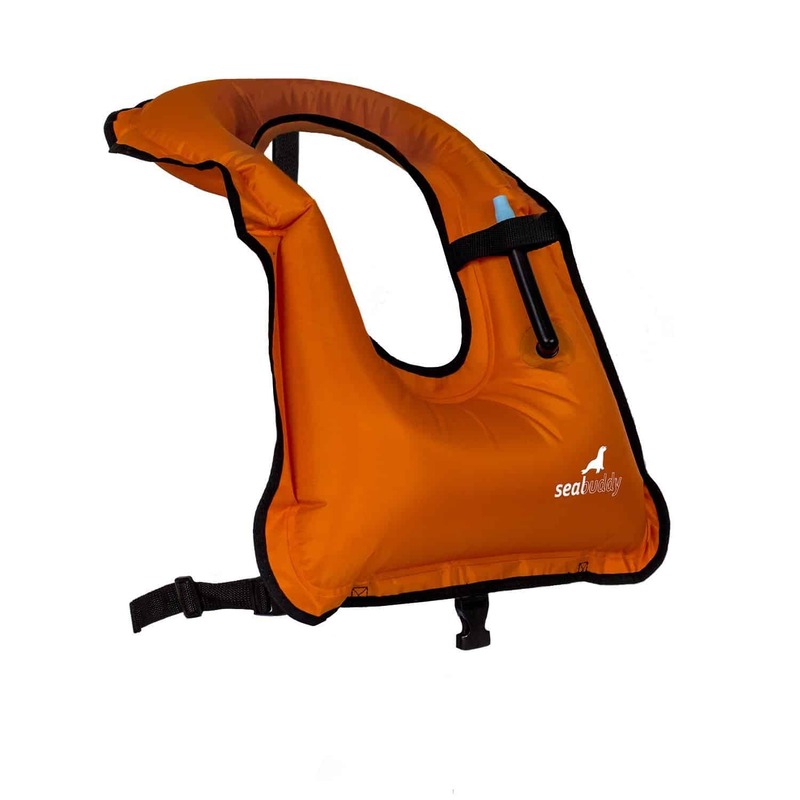 The PowerBreather come in 5 different models for different swimming requirements. 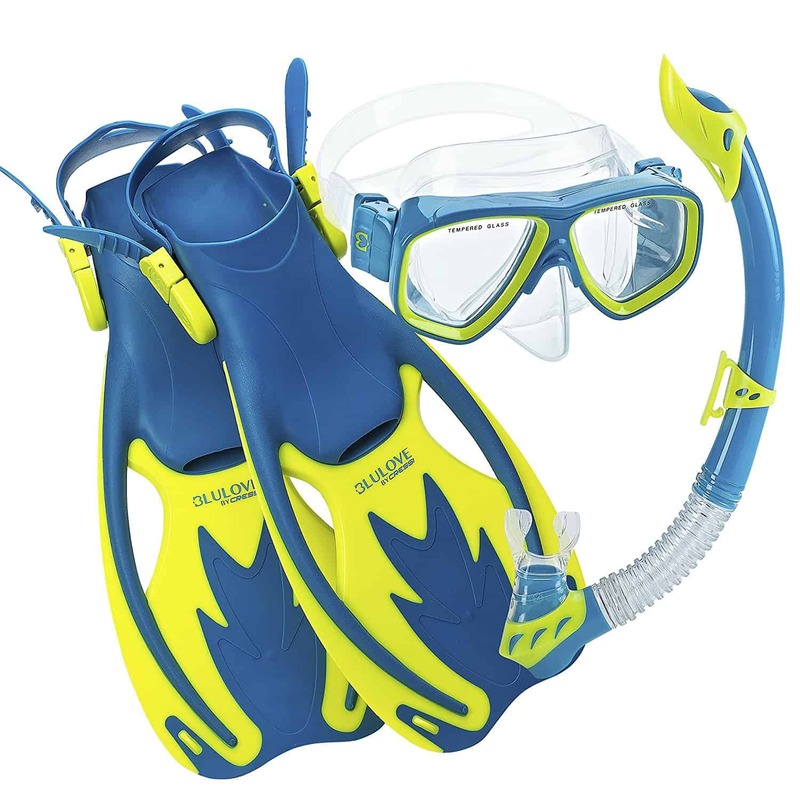 These are made for endurance and lap swimmers, as well as recreational snorkelers. One of the things that Tribord have missed the mark on, is their camera mount accessory. 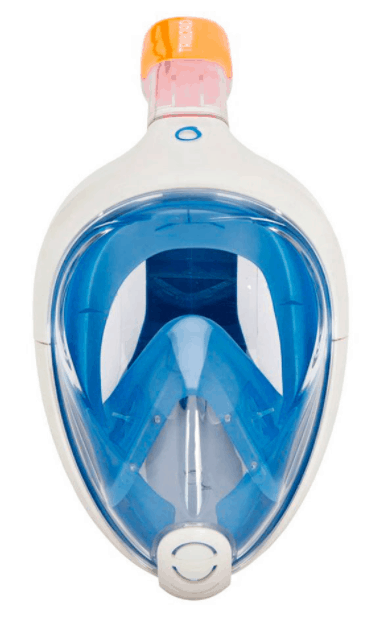 Many full face snorkel masks come with a 'built-in' camera mount on the top of the head section. Tribord have tried to compensate for their model not having this in its design. Their accessory piece slides over the snorkel and hangs low over the top section of the face mask. Not only does this impact on your view, but it can cause minor scratches on the lens. You can see the Tribord camera mount accessory (left hand image below) hangs low over the mask in comparison to the SeaView Panoramic built in camera mount (image to the right). 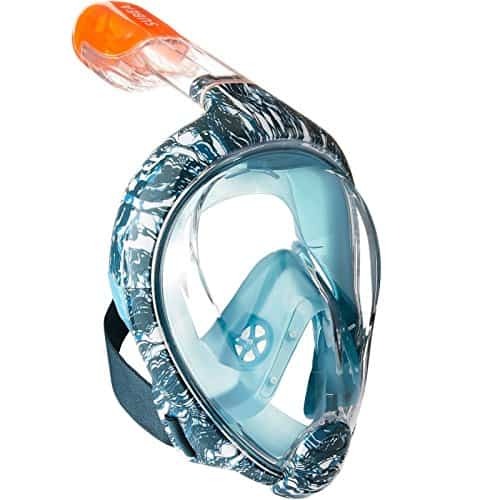 If you want to attach a camera to your snorkel mask, then you should consider buying a Wildhorn Outfitters SeaView full face mask. You can read a full review here. Sand and rough surfaces will scratch the visor of the snorkel mask, so make sure it’s always resting visor-side up. Rinse the mask after each use, as sand in the snorkel area can cause the float valve to stick. If there’s sand on the mask, don’t use force to clip the snorkel into place. Give it a rinse in fresh water before connecting. Don’t wash in the dishwasher, as this will damage the mask. A simple rinse in fresh water is all it needs. Keep the mesh bag that the mask comes in, as this is ventilated and ideal for storage. Always rinse the mask after use even if it’s only been in a swimming pool. Store the mask in the mesh bag and away from sunlight. The straps on the Tribord Easybreath are elastic and don’t get caught on your hair. It may look tricky to put a full face snorkel mask on initially but after a couple of goes, you’ll realize it's very easy to put on and adjust. It’s also very comfortable once in position. Put it on CHIN FIRST! Push the straps to either side, and place it straight onto your face, chin first. Then pull the elastic straps over the back of your head, and pull to tighten. Don't pull the mask down over your face as this can cause hair to come down over your forehead. Any hair (even a fringe) that is on the inside of the face skirt will break the air tight seal and water will leak in. You may need to wiggle it around to make sure it's in the correct position, and to where it feels the most comfortable. I’m going to just throw this out there: As a mom of an autistic kiddo, I can 100% recommend these for any parent whose child loves the sensory sensational of swimming. Many people with autism enjoy the soothing feel of water on their body. My boy told me swimming ‘takes the inside itches away’. My kiddo has never been able to get used to a snorkel mouth piece but would spend hours in the pool with a pair of goggles. 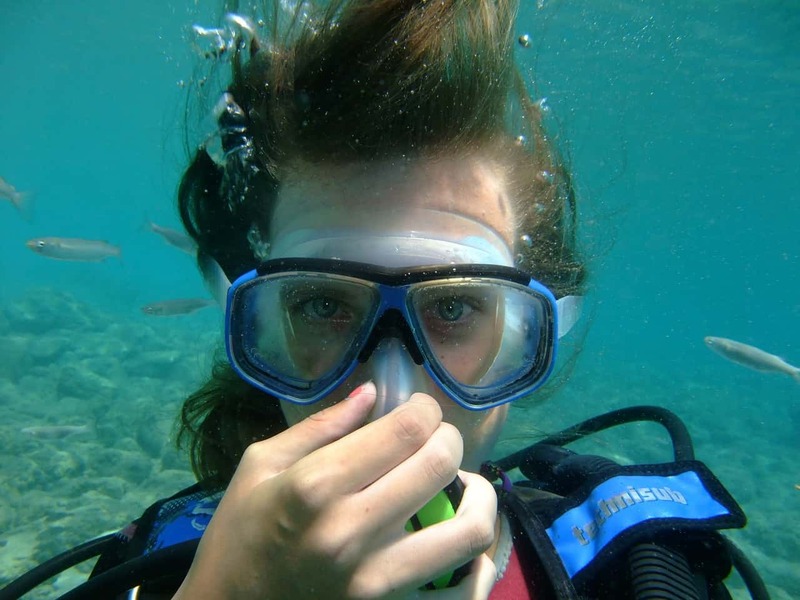 When snorkeling with the full face mask you can hear and talk to others around you. It is muffled, but it's still fun. After the initial adjustment for first-time use, my son swam for over an hour and not once did he need to empty out water, defog, or re-adjust the straps. There are now a lot of full-face masks available on the market and the prices, quality and accessories vary. 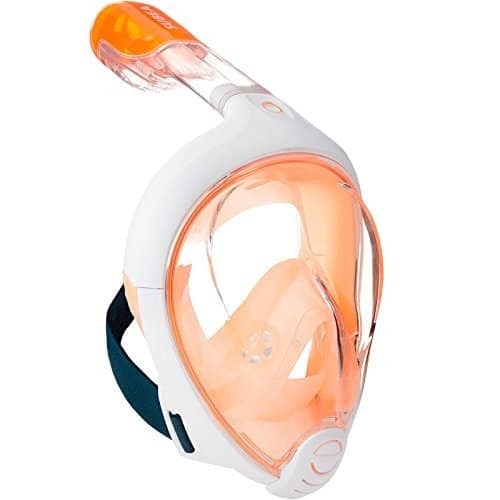 The 3 most popular full face masks are the Tribord Easybreath Snorkel Mask, the Wildhorn Outfitters Seaview 180° Panoramic Snorkel Mask and the Ocean Reef Aria Snorkel Mask. Before buying these myself, I had spent a lot of time researching different brands, reading reviews and watching YouTube videos. Since then, I have personally tested a range of these masks. The Tribord full face snorkel mask is well designed and made with quality materials. ​This is a great quality mask at a very good price. The BIG advantage this has over its competitors is the extra sizes. Having these additional sizes available makes it much easier to buy the correct sized for all members of the family. It has a bright orange fluorescent tip making it easier for other water users to see that there are snorkelers in the water. The Tribord camera mount accessory hangs low over the mask lens obscuring the view. The XS children's size is being phased out by some authorized sellers. I don't like the way the camera mount hangs low over the top of the lens, but I know other people don't mind this, so this comes down to personal preference. If you're not interested in a camera mount, then this isn't even something you need to think about. I recommend these to anyone looking for a quality full face mask, especially buying for children. These will last longer than regular snorkel masks if looked after properly. You can expect to have them long enough to pass on to younger siblings or cousins. 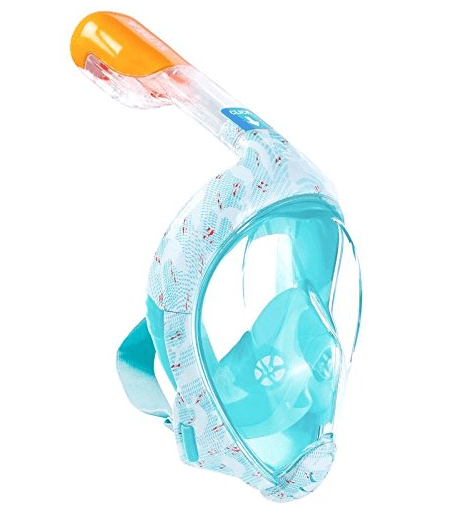 Click the button below to see the latest price on the Tribord Easybreath full face snorkel mask including any discounts that may apply on Amazon. Amazon UK don't supply the same range of full face snorkel masks as Amazon US. Most of what is available are the knock-offs from China. Tribord Subea is available on Amazon UK but these are currently only older versions, and don't appear to come in the full range of sizes. When selecting a full face snorkel mask, go for one with a flat screen. Anything with a rounded screen will distort the vision underwater which makes people feel dizzy. The biggest problem with many of the masks made in China is they're made with cheap plastic and low quality silicone. The snorkel piece can be difficult to take off once attached, causing cracking, and there's little flexibility in the silicone skirt so that it can either be uncomfortable, or lack the flexibility to create a nice seal around the face. For anyone in the UK or EU, I'd recommend the TECKMAX, and the WSTOO. The TECKMAX is good quality but there are reports of fogging. This applies also to the WSTOO. Buy a bottle of Cressi or Jaws Anti-Fog spray as this will reduce any fogging and you'll still enjoy a great mask. Wild Earth who are located on the Gold Coast in Australia will ship full face snorkel masks worldwide. Their current stock doesn't include children's sizes but this is a great alternative if you're looking to buy quality full face snorkel masks for teen and adults in this region. 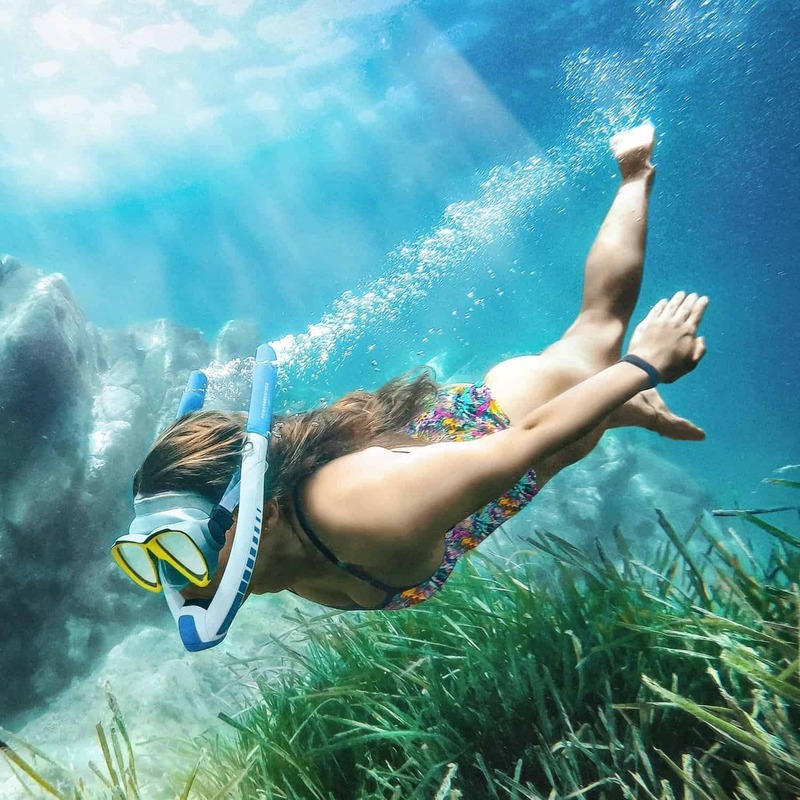 Even if you're not a strong swimmer, there's no need to miss out on the fun of snorkeling. 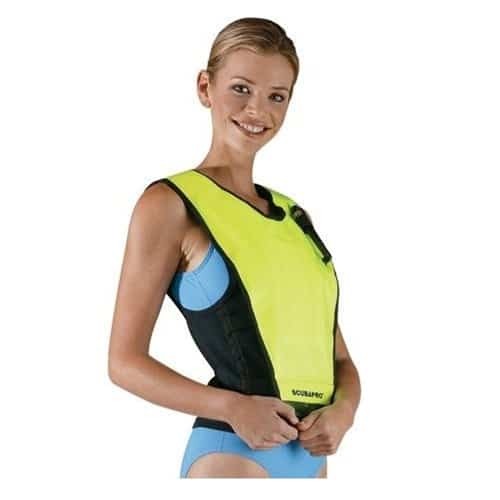 Snorkeling vests will really help increase and control your buoyancy, and give you extra peace of mind. These take the hard work out of swimming even for strong swimmers - they will keep you going for longer in a choppy sea environment. Being bright colored also makes it easier for other water users to see you in the water. Ranked number 1 is the ScubaPro Snorkel Vest. This is a quality product that offers a nice sense of security. It covers both the front and back of the swimmer giving extra sun protection. These are easy to inflate, and deflate and are very comfortable to wear. Next best is the SealBuddy Snorkel vest. These are also very easy to inflate and deflate, and come in a range of colors in adult and children's sizes. There is a tie around the back to keep them in place. 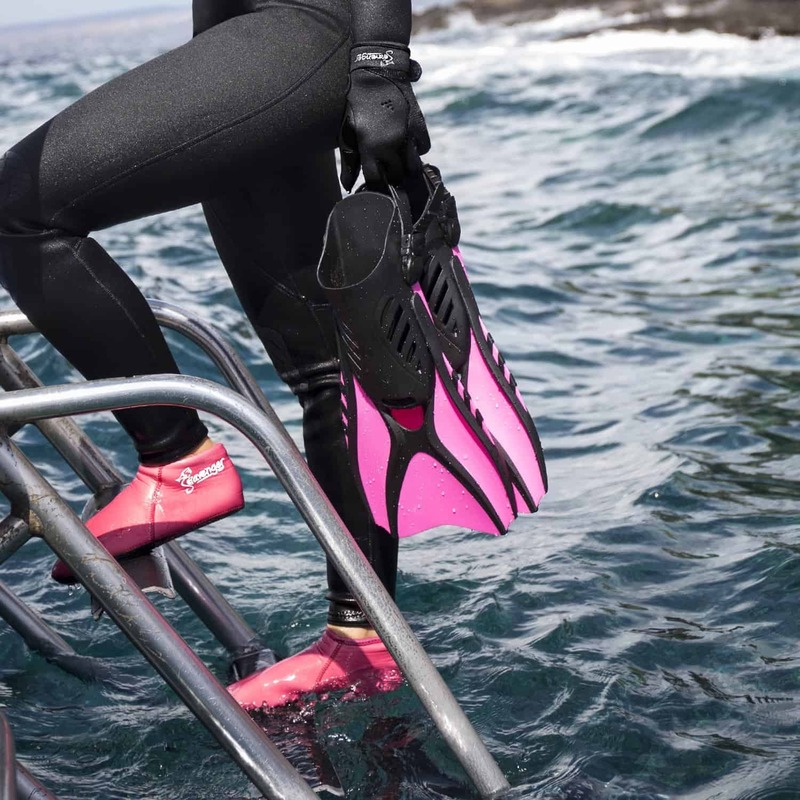 You can now avoid cutting your feet on coral or rocks with these Seavenger Premium 3mm neoprene booties. They have a dotted silkscreen sole to provide some traction on slimy rock surfaces. A 4-way stretchable neoprene ensures for great fit, and along with glued blind-stitched seams, these give extra strength, comfort and durability. Fun Toes are 2.5mm thick neoprene socks that will keep your feet warm wild cutting down down on chafing caused from fins, boards and water skis. These water socks have grip soles to help avoid slipping. The socks have extra thick soles and reinforced stitching to give extra protection on the soles of your feet. Fun Toes Snorkeling Socks come in a set of 2 pairs and will protect your feet even when you're not wearing fins. Fun Toes are 2.5mm thick neoprene socks that will keep your feet warm wild cutting down down on chafing caused from fins, boards and water skis. These water socks have grip soles to help avoid slipping. The socks have extra thick soles and reinforced stitching to give extra protection on the soles of your feet. Wildhorn Outfitters are have built a solid reputation producing quality products and backing it up with excellent customer service. Their topside fins are both a shoe or bootie, and a fin all in one. They fit like a shoe and have a closed-in toe which will help prevent cramping and hypertension in your foot. 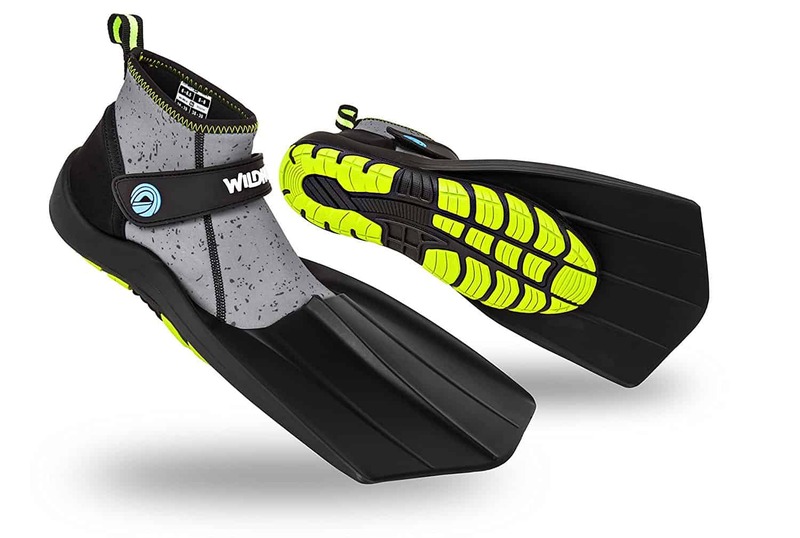 Each fin has an adjustable Velcro strap around the ankle to provide further support. The neoprene has some stretch that allows for a little flexibility in sizing. 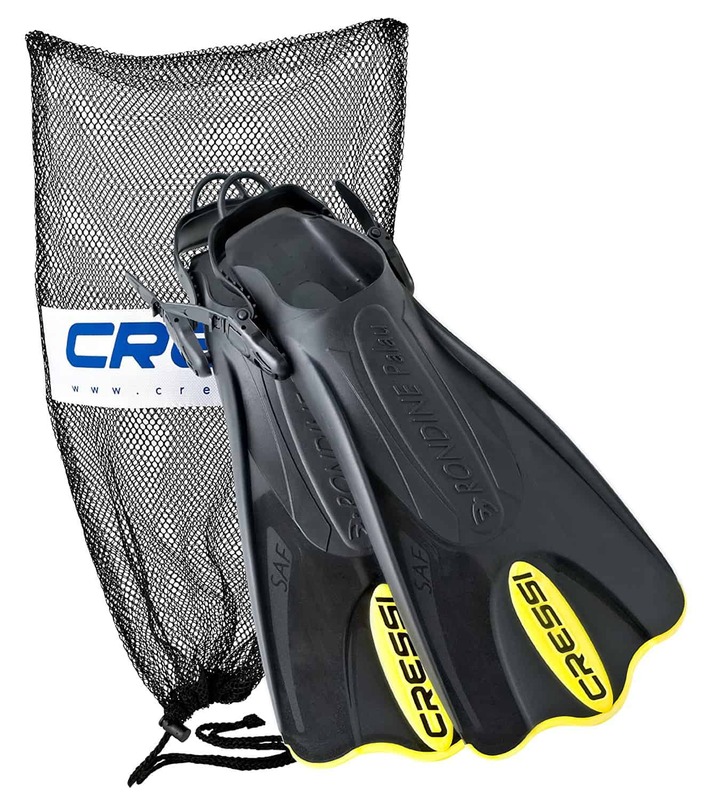 The Cressi Palau Short Fin is an adjustable fin great for using in the pool or at the beach. 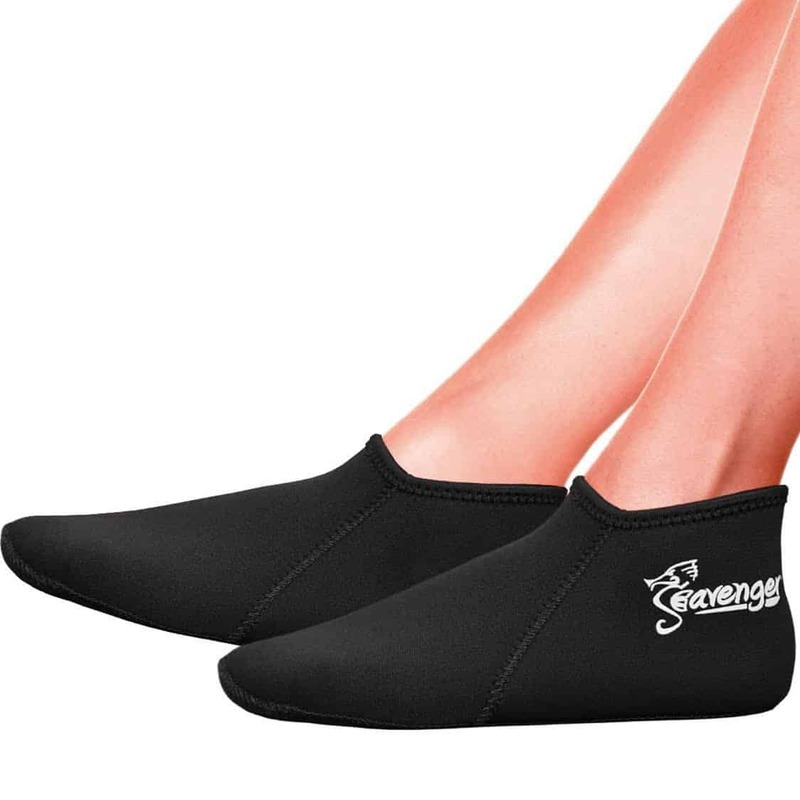 It has a soft short blade and foot pocket with a good heel strap making it easy to release or adjust when needed but won't slip or loosen as you swim. These are short enough to fit in carry-on or regular luggage without taking up too much room. The Cressi Palau Short Fin is an adjustable fin great for using in the pool or at the beach. It has a soft short blade and foot pocket with a good heel strap making it easy to release or adjust when needed but won't slip or loosen as you swim. These are short enough to fit in carry-on or regular luggage without taking up too much room. 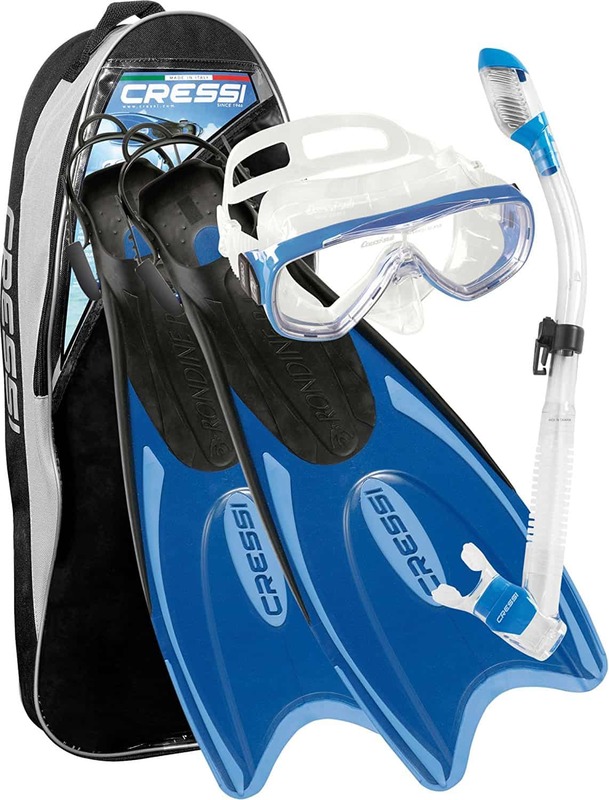 Cressi have been making quality masks, fins and other snorkeling and diving gear for a long time. 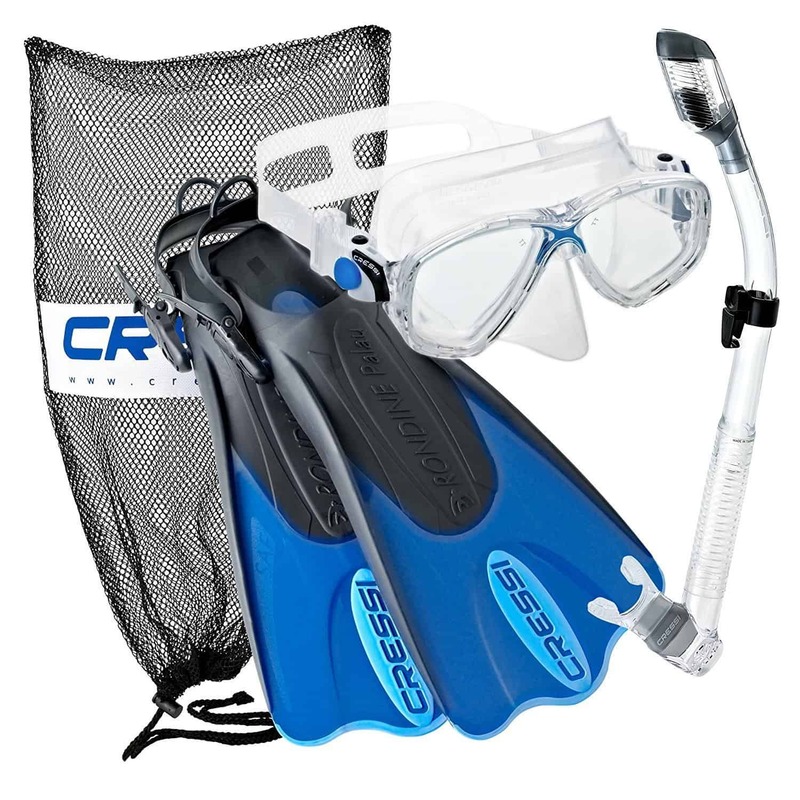 This set includes a set of Cressi Palau Short Fins, a traditional style two window face mask with a silicone skirt edge that adapts to fit most faces. 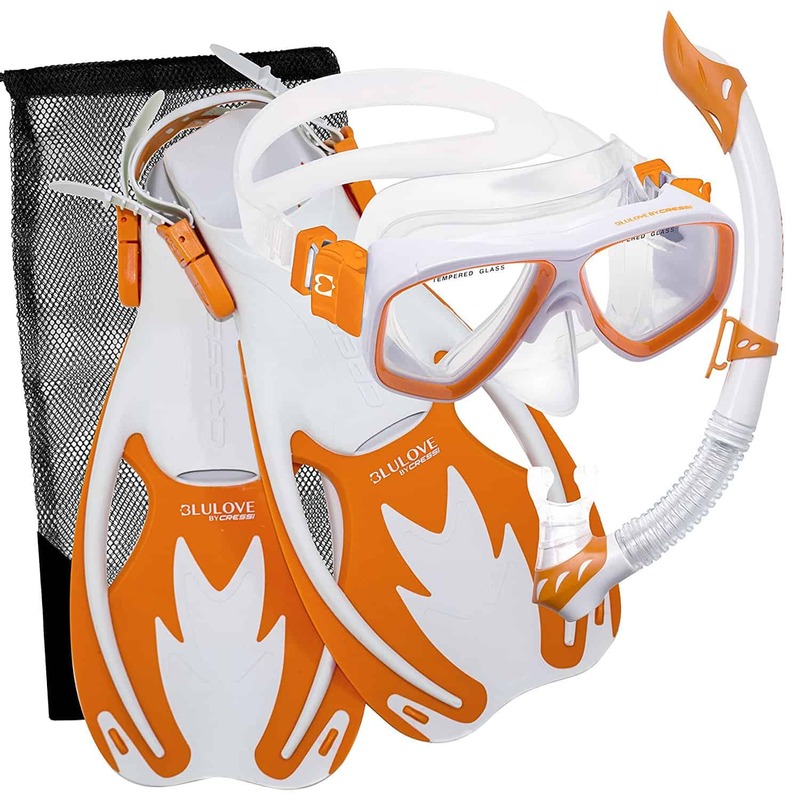 The set also includes a curved snorkel with a Dry Top similar to the full face mask snorkels - it has an anti-splash end with a valve that seals the tube as you dive. A mesh carry bag is included. The Cressi Junior Kids Rocks Snorkel Set comes in two sizes and is designed for kids aged 6 to around 14. The set includes a set of fins, a traditional style two window face mask with a silicone skirt edge that's designed for narrower faces. 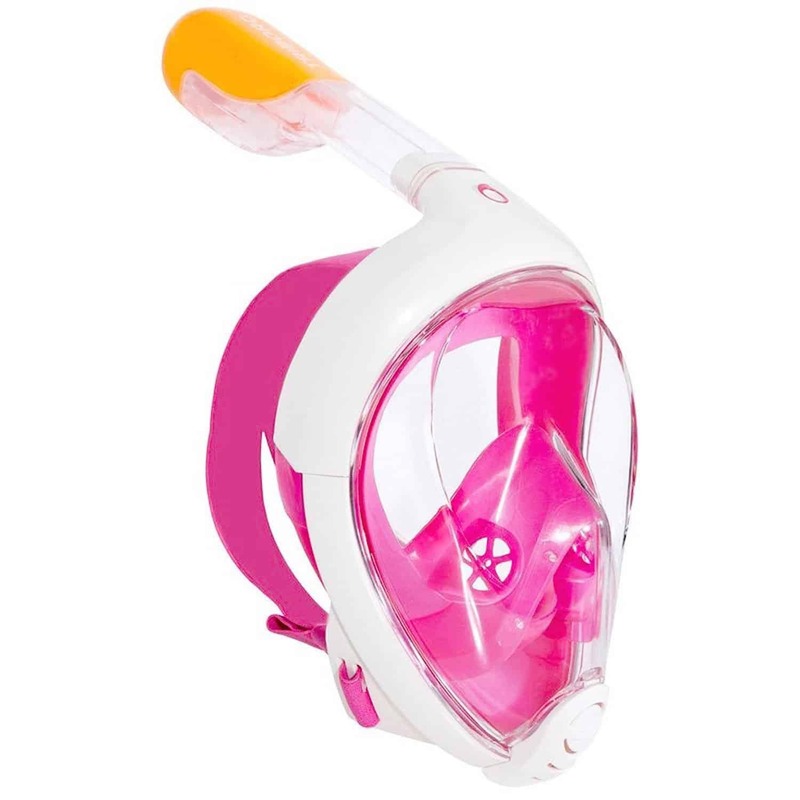 Also included is a curved Dry Top snorkel which is similar to the full face mask snorkels - it has a splash guard on the end with a valve that seals the snorkel as you go under water. A mesh carry bag is included. 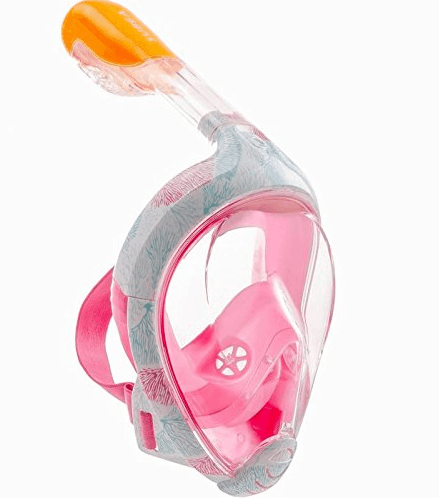 The snorkel is designed to go on left side of face so that it can be attached to the mask strap by a snorkel keeper clip. The fins are composite duel vented blades to provide excellent power and save energy while swimming. They have an open-heel with soft and comfortable foot pockets with easy to adjust buckles. 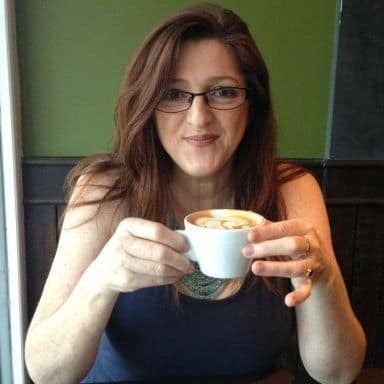 This website and it's articles are about providing valuable and helpful information for everyone looking for unforgettable holiday and travel experiences. Tribor (now Subea) were the first to invent the full face snorkel masks and they’ve done such a good job, everyone is trying to get a piece of the action. I have Tribord masks and they’re good quality, and I’m glad I was able to support the original designers. These look fantastic, especially for kids, as you say. I think they would also be better for contact lens wearers, though any water sports with contact lens is always a bit more tricky. I love the other color options for those of us with a larger family. Different colors help tell which belongs to who, especially for children, don’t they. James recently posted…Best Kayak For Kids – Choose the Right Kayak for the Little Ones!